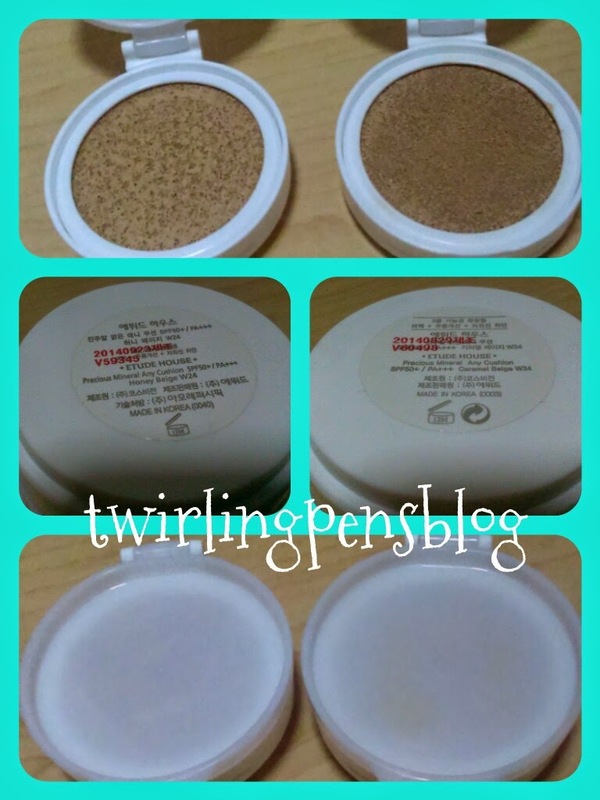 Hi guys and welcome back:) I just recently bought another Mineral Cushion from Etude House. I know, I should’ve learned from my previous buy (also bought the darkest colour from awhile ago). But I was hopeful, since they just came out with a new, darker colour! Comparisons between the two. Top picture: On the left, W34 Caramel Beige (newest colour). On the right, W24 Honey Beige (earlier buy). Middle picture: The two colours. As you can see above, I have the two current darkest shades (W24 and W34). I tested W34 in stores, along my entire left cheek, and asked my mother if she could see it. She couldn’t, so you could say I was somewhat optimistic about the buy. I wasn’t expecting a perfect match since my forehead and my cheeks were different colours, but I expected a close match. Here’s the thing. I have post-teenager skin. When I’m not stressed and drinking enough water, it stays relatively oil-free when I don’t apply anything beyond basic skincare (toner, moisturiser, lip balm and sometimes eye cream) and sunscreen. When it’s stressed, even if I chugged down a litre of water, my skin becomes an oil slick and nothing will stop it. I’m currently just close to the older spectrum of teenagers (I’m 19), so the oil production is slowing down to a more manageable standard. I still get oily when I forget to put on my basic skincare but that’s normal. My needs are foundation that doesn’t get chalky, does not melt and matches my skin colour and tone. I tried the cushion for the week (excluding weekends since I don’t wear any unless I’m going out for an extended period of time) and here’s what I found. On the first day that I tried it, the product sprouted holes around my upper lip and clogged up the pores around my nose area. By the end of the day, the colour looked chalky and had melted away around my hairline on my forehead. I also looked really shiny. It was probably my worst nightmare, and the best (or worst part depending on how you look at it) was that I was in a rush that day, and had nothing on except that. I did eventually apply lipstick, in 535 Rum Raisin. It was pretty much the worst thing I could have done since there I was with mismatched skin base and a too dark lip. It felt like the 90s gone to hell. After a good talk with my mom, I ditched the Nivea Refreshingly Soft Moisturising Cream for the next day, and more careful with blending the cushion into the skin. It doesn’t really oxidise, which is good if your skin actually matches the base. I had to make sure the fluid adhered as close and as seamlessly with my skin, or people wouldn’t buy that I had perfect skin. I also made the whitening/brightening trio (The White Seed Series from The Face Shop) of skincare a regular in my day and night routine. Pimples were going away, but I needed to take care of the scars. Day Two worked out much better. I found that the Korean method of powdering up actually works, giving a watery feel without being too greasy. The video above sort of shows the two different base styles I now have experience with. I’m more of the flawless, matt type, since my skin is still on the oily side. I actually don’t mind the oil, I am more bothered if the base slips off or disappears. But I’m digressing, so let’s continue. I powdered along my hairline, chin and on my under eye and eyelid. I found (like if you’d watched the video above) that matte eyeshadows and blushes work better on glowy skin than the sparklies. It really adds to the moisture and brings it into disco ball territory. This took me the rest of the week to nail. I have videos from the week that I’ve made while wearing the cushion, and mentioned it in one. This is one of them. I’m uploading another one in awhile (need to sleep). I really don’t have much gripes about the product. I mean, it stays put, doesn’t do a vanishing act and has a high colour pigmentation. My one really gripe is the colour selection, which I think they (Korean Brands) will eventually have to face before the American brands (as well as other brands) catch up and actually take over their business. 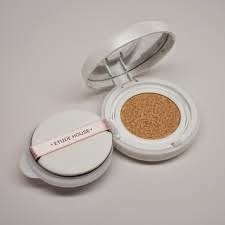 I mean, Lancome has already put out their own, more colour varied, cushion compact. It’s called the Lancome Miracle Cushion, which goes as dark as Mocca (although the brand calls it Moka). Laneige also has a colour selection up to Coffee as I recall, but it’s only up to my colour. If you check the two colours, even online Lancome beats out Laneige. People should call it the ‘Battle of the Ls’. But come on, Lancome has Penelope Cruz and Nupita Nyong’o on their ambassador list. I hate griping about such things because it leads to arguments about racial diversity and religious differences, which are two very sensitive subjects and themes to navigate through. I just want cushion on a budget-friendly range that has enough variety to suit a wider range of skin tones than what their own country can produce. So here’s the end. Thanks for reading my gripes and struggles.